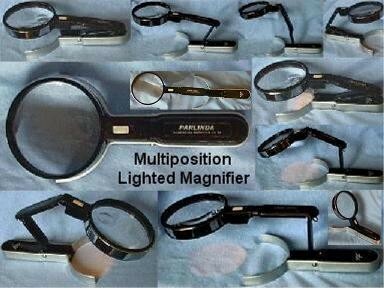 This One Must Be, by far, The Most Versatile Magnifier in Our Inventory! On Your Desk or in Your Pocket... You can Use it in Any Position and Anywhere You Want to. Raise it, Bend it, Swing it, Extend it and Turn it Any Which Way That's Right for Your Task. Whether You Put it In Front of Your Eyes or Under Your Nose ... It Will Stay in the Position and at the Angle of Your Choice. Provided with a Generous 3" Diameter 2X Lens and with a 3/4" Diameter 4X Insert, This Magnifier Lends Itself Well to Many Tasks. Whether You Use it to Examine Jewelry or Gems, Look Inside the Movement of a Watch, Inspect and Catalogue Coins and Stamps, Do Hobby Work, Admire Miniature Art, Mold Making, Photography, Printing or Just for Reading the "Fine Print" of a Document, This is a Very Useful Gadget to Have. It Can Easily Be Carried in the Inside Pocket of Your Jacket, Inside a Lady's Purse Or, You May Want to Keep It Handy in Your Desk Drawer or ... Get Two ... And Solve the Dilemma! If You are a Pilot, Navigator, Skipper or Just a Car Driver (Like Most of Us) and Want to Plan a Trip, You'll find This Magnifier "Perfect" for Preparing Your Plans "Hands-Free" and Ideal for Consulting Your Maps While Enroute. The Light is Bright Enough to Illuminate the Charts and Dim Enough to Maintain Your Eyes Adjusted to the Darkness. Approx. 5 1/2" From the Base to the Lens (Set Horizontally). 2X Plastic 3" Diameter With 3/4" Diameter 4X Insert. Metal and ABS Plastic Construction. 3 Hinges with 4 Hinged Sections. Made in Hong Kong to US Specification.